Like many nerds, I draw much of my inspiration from beloved geeky media. At any given time I have several game designs in my back pocket inspired by Avatar: the Last Airbender, Girl Genius and Sherlock. But the vast majority of my media-driven inspiration obviously comes from the Whedonverse! 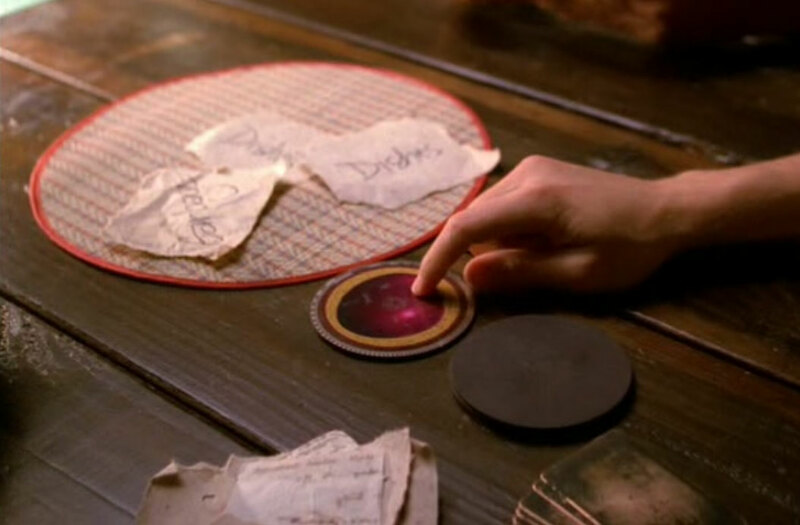 Today's Whedonverse game inspiration comes from the Shindig episode of Firefly, which has been a rich source of game designer fascination in the past. In this episode, Jayne, Book, and Simon are seen playing a gambling game with cards depicting fruits. When it comes time to bet, the characters are seen anteing slips of paper with chores written upon them: Simon and Book both ante "dishes," while Jayne antes "garbage." They appear to be gambling to determine who must do which chores for the coming week. While others have been inspired to make entirely new games inspired by this scene, and yet others have trying to discern the rules of the game they were playing, I am particularly interested in the design of their betting system. First, the obvious part. From the 20 seconds of gameplay we see, we already know that each chore appears multiple times. Although there could be several explanations for this, I think the most likely one is that each token for a chore means "I do not have to do this chore." Thus, if Jayne is usually assigned to dishes and Simon and Book are not, Simon and Book start with "dishes" tokens and Jayne does not. This way winning a hand means the winner are gets the right not to have to do chores, as it should be, and in accordance with what Book says when he wins a hand: "That's a nice pile of things I don't have to do." From the same 20 seconds of gameplay on screen, however, there's another gameplay issue: how is it that the three players are allowed to ante different chores? And more importantly, how are they going to match bets later in the game? If there is nothing more than the system we see in the game, then there are two simple explanations for this. One option is that each chore has the same value. This way, players can ante whatever they want (presumably the tokens for the chores they don't mind doing). This would extend to betting the same way. On Jayne's turn to bet, he could put it any number of chores and his opponents would have to match his number of tokens. A second option would be that the players agreed on the values of the chores beforehand, giving the less desirable chores higher scores. In this case, dishes and garbage were probably both worth one, but septic tank probably had a much higher value. While both of these solutions could have functioned in their game, and would work just fine if you want to play poker with your family members for the chores, I want to propose a different gambling system that would allow players to bet apples against oranges without equating them in any way. I'm going to showcase this design through a fictional game: Meta Strip Poker. Meta Strip Poker is a card game in which, the players play players playing strip poker. Each player receives a NSFW mat showing the naked body of their character, we three card slots: one for torsos, one for legs, and one for feet. There are three decks: the clothing deck, the titillation deck, and a regular deck of poker cards. Clothing in the clothing deck corresponds to the three slots (torso, legs, and feet), and to start each player is fills each of his or her clothing slots by going through this deck and pulling the first card he or she finds for each open slot on the mat. Clothing cards have two sides: outerwear and underwear. They are initially taken outerwear side up, but the owner of the clothing may peek at his or her underwear. Titillation cards tell the players their goals. Each one has a type of body part (feet, for example) or a type of underwear (undershirt, for example), associated with a number of victory points. Each player is dealt six of these cards, 3 face up and 3 face down. At the end of the game, players get points for each one of their Titillation cards that matches an opponent's revealed body parts or clothing. The core gameplay is simple Texas Hold'em, but betting works slightly differently. Left of the dealer starts the betting each round, and offers one or multiple pieces of clothing to bet with (shown by turning them 90 degrees). Once he has bet some clothing, the bettor tells the next player on his or her left which pieces of clothing she must bet to stay in the round. The may either bet that clothing (by turning it), or fold. This continues through all the players, and through each of the betting cycles. At the end of the hand all players first take off clothes: if they bet outerwear and lost the hand they flip the outerwear to the underwear side. If they bet underwear and lost the hand, they remove that card altogether revealing their character's body. Finally they tally their scores by matching their titillation cards to their opponents' revealed body parts and underwear, then are dealt new cards and another hand begins. When gambling with items with subjective values, reducing them to objective values (like monetary worth or simply '1' point) is a mistake. Unlike betting with money, betting with chores, meals, or clothing allows for richer interaction in the betting process due to players' differing opinions about each item's importance. The betting system underlying Meta Strip Poker is designed to capture this potential and make the players' decisions about which items are important to them, and which items are important to their opponents into core strategies of the game. Now that the system is built, we need playtesters! Go forth and gamble away your chores!